Los Angeles and San Diego water officials may join forces to stop a new project, President Trump throws support behind legal pot markets and more in our daily roundup of news. Both local and national media outlets descended on downtown San Diego Friday to hear from Hector Barajas — a once-deported Army veteran who was sworn in as a U.S. citizen. Barajas was brought to the United States as a child and served in the 82nd Airborne Division until being honorably discharged. He was arrested soon afterward for firing a weapon at an occupied vehicle and served two years in jail.He was deported twice. Barajas spent nearly a decade in Mexico, where he became a leader of Tijuana’s deported veteran safe house. In April 2017, California Gov. Jerry Brown pardoned Barajas and cleared the way for his citizenship. He was late to his own press conference on Friday because of traffic at the border. 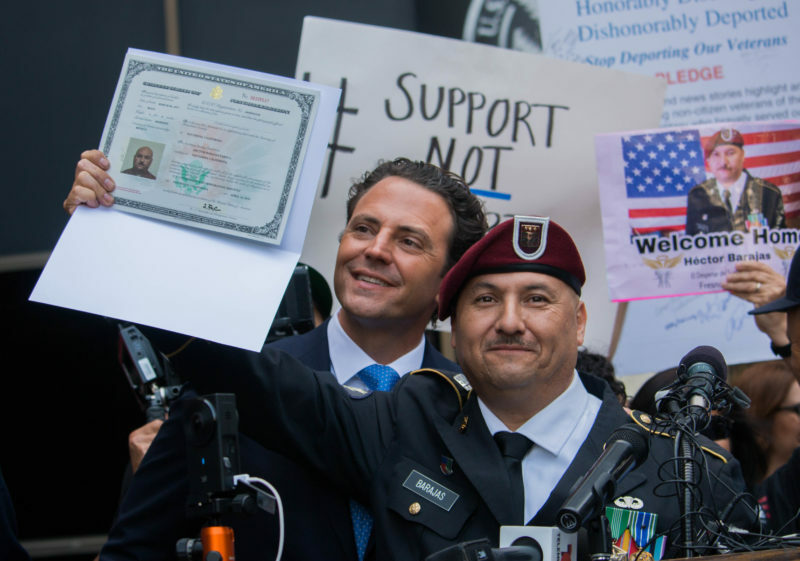 Barajas was joined by Rep. Mark Takano, a Democrat from Riverside, and by former Assemblyman Nathan Fletcher, who chairs the Honorably Discharged, Dishonorably Deported coalition that works with Barajas and others. Gov. Jerry Brown reluctantly agreed to send the National Guard to the border but made clear to the Trump administration that the troops will not help build the wall and will not enforce federal immigration law. “It will not be a mission to round up women and children or detain people escaping violence and seeking a better life,” Brown said in a letter to the Pentagon. Voice’s Sara Libby notes in the latest Sacramento Report that state Sen. Ben Hueso took the opportunity to chastise the president. “Although Trump is positing this move as a critical security measure to combat a spike in illegal border crossings, the fact of the matter is that border crossings are lower today than they have been for the past four-plus decades,” he said in a statement. Also in this week’s Sacramento Report, Brown made calls this week to members of the Metropolitan Water District of Southern California and urged them to agree to spend $11 billion on a new water project, which they ultimately did. San Diego and Los Angeles water officials are not happy about that decision, and they could form an unusual alliance to stop the project. In the meantime, San Diego Mayor Kevin Faulconer made the rounds in the state Capitol this week to talk about housing, and Assemblywoman Shirley Weber unveiled a new bill to reform the way the state funds schools. On this week’s VOSD podcast, hosts Sara Libby, Andrew Keatts and Scott Lewis consider a moment of bipartisanship. in which Republican County Supervisor Ron Roberts indicated that he might support Democratic Assemblywoman Lorena Gonzalez Fletcher’s proposal to kill the Airport Authority. He thinks the agency has done nothing to help with traffic congestion near the airport, CityBeat reported. San Diego City Council candidate Jen Campbell appeared on the second half of the show and addressed some controversial remarks she previously made about the homeless. She’s running to represent District 2, which includes some coastal communities, and said she’s open to a ban on whole-home vacation rentals but is fine with people who want to rent out rooms in their homes. San Diego’s cannabis industry has been on high alert since the Department of Justice, in January, rescinded memos that provided local U.S. prosecutors with guidelines on when to interfere with legalized dispensaries, growers and distributors. California legalized cannabis in 2016 for recreational use. The federal government still considers it a class one narcotic. The Washington Post reported that President Donald Trump has promised to support congressional efforts protecting Colorado and other states with legal cannabis markets. In exchange, Colorado Sen. Cory Gardner, a Republican, would stop holding up Justice Department nominees. Although Trump has indicated all along that states should be able to do what they want with cannabis, Attorney General Jeff Sessions has signaled the strong possibility of crackdowns. Whether Congress moves to actually protect Colorado, California and other states is another question and depends on the will of the Republican leadership in the House and Senate. There’s some indication that opinions may be softening on this subject. As House Speaker, John Boehner adamantly opposed cannabis reform, but recently joined a company that seeks to roll back federal regulations. He said he’s convinced the plan can help veterans and reduce the opioid crisis. In an interview with the Union-Tribune, San Diego County Democratic Party Chair Jessica Hayes acknowledged some of the concerns raised by an op-ed we published last week. It was written by 30 Democratic women who say complaints of sexual harassment have been undermined and ignored by local leadership. In response, Hayes said the party is limited by internal rules and the law, but is taking steps to improve the process. She also questioned the motivations of some of the writers — suggesting they’re disgruntled because the party did not endorse their campaigns in the June primary. • Will Ferrell dusted off his “Anchorman” character Ron Burgundy at a get-out-the-vote event for the upcoming 49th Congressional District primary, but coverage of the Oceanside event was overshadowed by a traffic crash after the event wrapped. TMZ reported that Ferrell’s SUV flipped over after it was side-swiped; he and two others were taken to a hospital. These were the top five stories for the week of April 6-13. To see the full top 10 list, click here.